We arrived in Medellin after a short flight and enjoyed a beautiful view of the mountains and countryside during an hour bus ride to our hotel. We can feel the difference in climate from the tropical Taganga. In the Andes, where we are now, the weather is beautiful—much cooler and far less humid. After checking into the hotel we took a tour around the city with our group. We walked to the metro station and took the rail 8 or so stops before transferring to the cable cars that take you up the steep mountainside to get to the poorer area on the outskirts of the city. 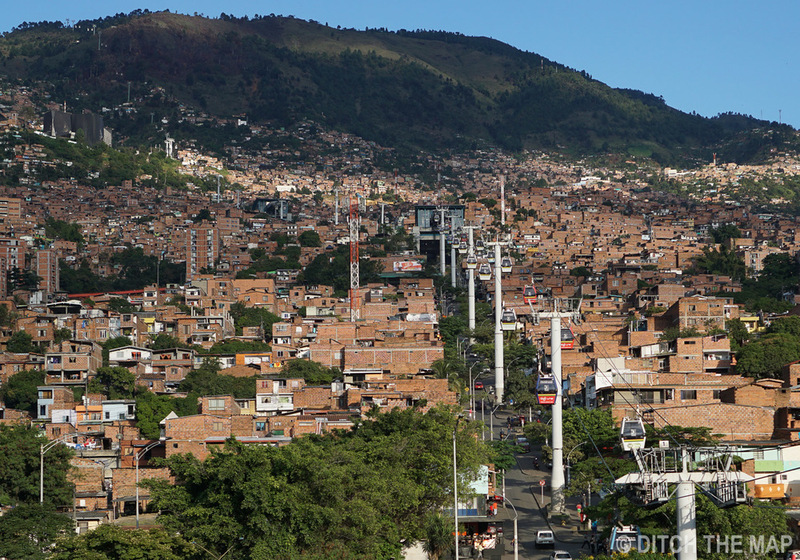 This area of the city was full of life—children and teenagers lined the streets playing, tons of street venders, beautiful views of the city, cheap street food, and even a free public library. The cable cars were added to enable the poorer areas access to the center of the city. It was amazing how many kids there were all over. Some were in school uniforms, but many of girls were in skimpy outfits. I couldn’t believe my--eyes. Many of the boys acted like little thugs. We walked around a very ‘hopping’ part of town later that night—closer to our hotel—and we couldn’t believe it. The party scene puts anything else I’ve seen to shame. The density/quantity of bars and discos far surpass that of South Beach and Vegas. All bars were open-air and had very different themes from each other. They would blast their music as loud as possible, trying to compete with the bars next doors. Drinks were expensive here (relative to Colombian prices). However many people would simply buy beer at the shops right next door, for ¼ the price, to the bars and drink it in the streets. The scene seemed a little bit like New Jersey. From the looks of things very long straight hair is the 'must have' here in Colombia. I think they're extensions, but Sylvie thinks their real. We ended up getting a crepe w/ nutella, banana, strawberry (for $2) and then an ice cream for $0.33. Finally ended up in our room after midnight after a long day of travel and walking around the city. Today was a busy one. Trip to escalator was an adventure-transferred metros, to a bus (no one spoke English), followed a women who offered to help us, walked through people’s back yards to get to top of escalator—went on a slide in somebody’s backyard. Great view of city, poor town, got a beer. Took the bus back to train, transferred trains, and then walked back to our place. We have an overnight bus that will arrive in Bogota around 6am tomorrow.